How many people eat vegetarian in Switzerland? And how many live vegan? These questions are often asked. As there were no current figures, Swissveg has commissioned the market research company DemoSCOPE to carry out a representative survey1. For the first time, the current number of vegans in Switzerland was also recorded. We would like to introduce you to the positive results. To start with the most important: 14% of the Swiss eat vegetarian or vegan (11% vegetarian, 3%vegan). Additionally there are 17% flexitarians. Approximately one-third of the population is therefor conscious of a meat-free or a less meat-based diet. 69% of the population regularly eat meat and / or fish. The figures are based on self-declaration: Who sees himself as a vegan / vegetarian? That's why Swissveg has asked how often the vegetarians and vegans make exceptions in their diet. If these answers are included and only people that exepentiolessly eat vegetrian or vegan are accepted the results would show 1,5% vegans and 6,8% vegetarians. Altogether, 8.4% of the Swiss population never consume meat (including meat products and fish). Among the 15- to 34-year-olds there are even 6% vegans. Altogether, there are also more vegetarians and flexitarians represented in this age group. Most of the meat eaters are in the age group of 35- to 54-year-olds (76%). In German-speaking Switzerland, there are significantly more vegetarians than in the Western part of Switzerland (12% compared to 5%). Also the number of meat consumers in total is with 67 % lower in the German-speaking part than with 76% in the French-speaking part. It is striking that the proportion of women among vegetarians is 70%, but among vegans only 40%. The following are the main reasons for the meat dispensation: the animal welfare (78%), ethical reasons (60%), ecological reasons (58%), the contribution to the global food security (40%) and the own health (35%). Daily meat consumation is significally higher for men than for women with 24% of men eating meat daily and 15% of women. 6% of men and 2% of women consume meat several times a day. Overall 20% of respondents said they eat meat daily, and another 60% eat meat several times a week. The daily consumation of diary products amounts to 47%, the several times a day diary consumption to 11%. The results show that the number of people eating vegan has greatly increased to 3%. 17% of the respondents said that they have been living vegan for a period of 6 to 10 years. 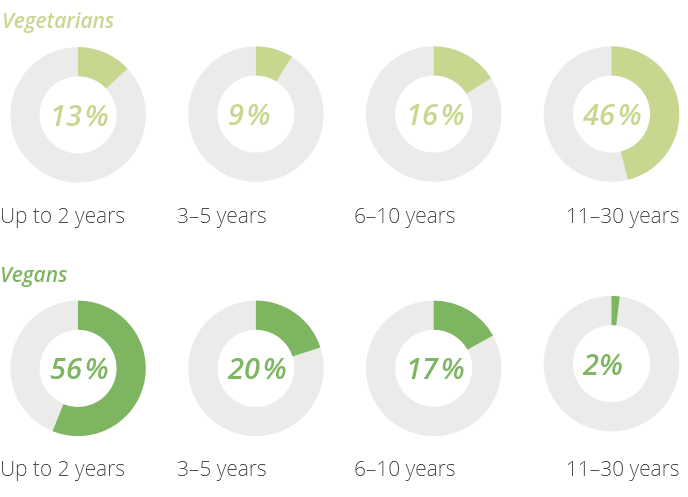 20% for 3 to 5 years and the largest proportion with 56% for up to 2 years. Although the word trend sometimes has a negative meaning, we think living vegan is a trend. A trend is a change that is observable as well as a continuous developement. We suppose that this movement has not yet reached its climax. 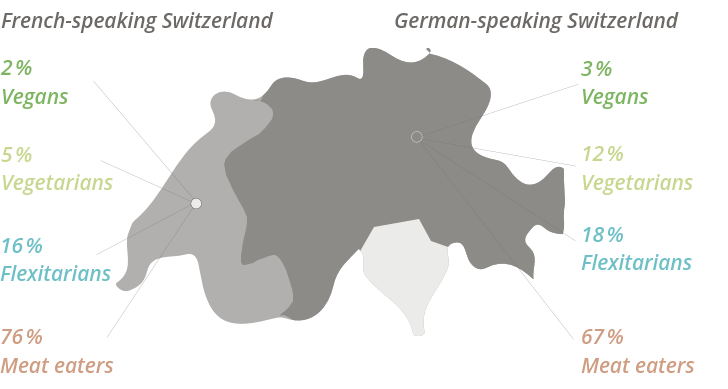 Just 20% of the vegetarians or vegans live in rural areas and only 21% of the Swiss vegans live in the French-speaking part of Switzerland in comparison to the German-speaking part. The Italian-speaking part was not interrogated. Does the level of education have an influence? Vegan-eating people have signifcally more often completed a higher education (47% of vegans). As a whole, people with university degrees consume much less meat than the population average. The meat eaters polled answered the question why they do not eat vegetarian or vegan with 75 % that they «like to eat meat». Followed by «own health» (30 %), «I have never had any interest in it» (29 %), «because of the taste» (25 %) and «out of habit» (23 %). There is still a need for clarification that a plant-based diet has many health benefits. 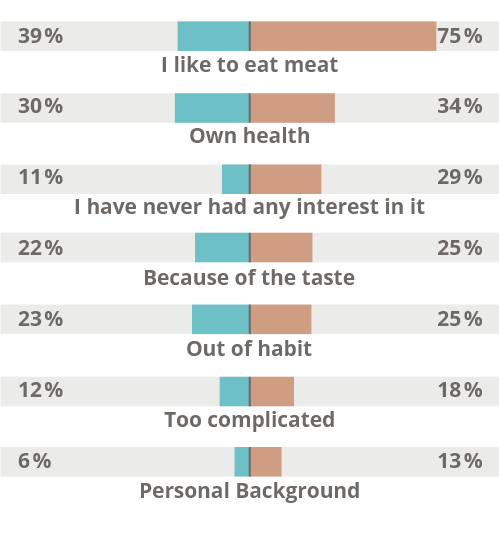 Flexitarians claim with 13 % that they still consume meat because of their background and for 18 % of the people polled it is too complicated to go without meat. So if the vegan offer, especially in restaurants and canteens, continues to increase it would be supportive regarding the free choice of menus. Obviously there is a demand. The «average vegan» is between 15 and 34 years old, well educated and lives in the city. The vegan diet is continue to grow and still has great development potential. Vegetarians on the other side, even if they tend to be younger, are represented in all population groups. The numbers speak for themselfs with regard to the positive perception of the vegetarian and vegan lifestyle. This effect is due to the tireless efforts of Swissveg causing the plant-based diet to evidently find more and more supporters. The study was conducted between 26.01. and 18.02.2017 with 1‘296 persons (CAWI ad hoc) in the age between 15 and 74 years in the German-speaking and French-speaking part of Switzerland. The confidence interval is +/- 2.8 % (at 50 %). In 3% (vegans) the confidence interval is +/- 0.9 %, the true value is between 2.1% and 3.9 %. For the vegetarians (11 %) the confidence interval is +/- 1.7 %, the true value is between 9.3% and 12.7 %.